Over the past few days, I’ve participated in two watershed cultural moments. First, I went to see Star Wars: The Force Awakens in a theater with reclining seats. Second, I watched eight straight hours of The Great British Bake Off. Guess which one has affected me more? 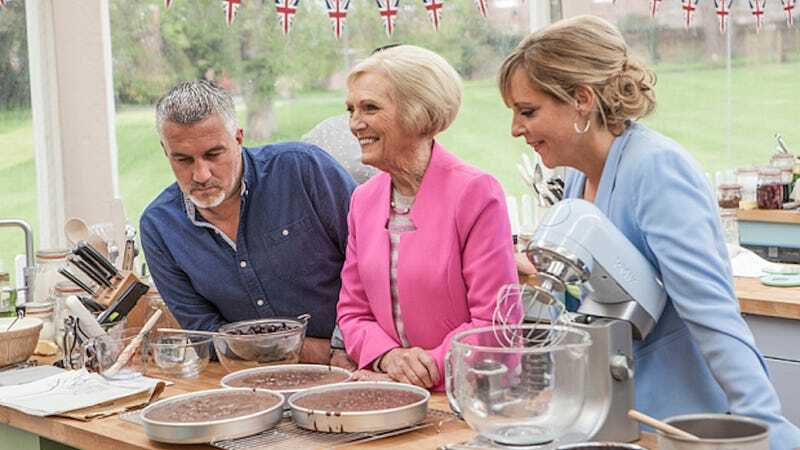 The Great British Bake Off (known to American viewers as The Great British Baking Show) is a British cooking competition that’s entirely devoted to baked goods (breads, pies, cakes, pastry, etc.). Its fifth season is currently up on Netflix. You should watch it because it happens to be the most calming and genteel competitive reality show of all time. You don’t so much watch The Great British Bake Off so much as you let The Great British Bake Off wash over you. Relax and you will be rewarded. You will learn that to understand true patience, you must first watch the delicate dough of a kouign amann—a flaky cake from Breton—rise the appropriate amount before putting them in the oven. And—again! again!—you must wait as they turn a beautiful golden brown. Hurry and they will be ruined. Hurry and you will never be Star Baker. Can you know true angst having never witnessed the anguish of a melted Baked Alaska? Do you know true camaraderie if you’ve never helped your competitor, 17-year-old Martha (the youngest in the competition! ), crumble bacon on top of her American-themed éclairs even though it’s to your benefit to watch her fail? Have you ever truly laughed if you’ve never laughed at the punny and accessible jokes of presenters Sue Perkins and Mel Giedroyc? Truly felt supported without their embraces and words of encouragement? In the eight hours spent watching The Great British Bake Off, I learned that there is but one path to Nirvana and it begins with watching the beautiful, work-worn hands of a 70-year-old woman as they methodically count poppy seeds on a clean white plate. I discovered that tranquility is learned in the stern glances and approval of judge and legendary baker Mary Berry. I’m back in my childhood home for the holidays, which means I’ve been watching The Great British Bake Off with my mother. Yesterday, she took me to one of her favorite cafes for lunch. We smiled at each other serenely. Image via The Great British Bake Off/BBC Two.